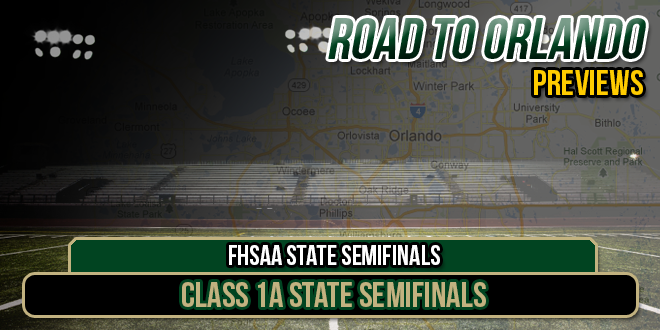 FloridaHSFootball.com breaks down tomorrow’s Class 1A state semifinals with the final four teams remaining to contend for two spots that will have them playing at the Citrus Bowl next week. Included our predictions from Publisher Joshua Wilson and Senior Writer Corey Davis as well as Joe Pinkos’ prediction. Skinny: What a year it has been for the defending state champions in Port St. Joe, which started off the season with a viral meningitis scare that sent the team scrambling to keep player healthy, but resulted in a canceled game with rival Wewahitchka. While being able to quickly slip past Chipley in the first round, Port St. Joe found Blountstown to be challenge for the second time this year, needing two overtimes to survive what was a defensive battle. Port St. Joe finshed with 199 total yards against Blountstown, but didn’t lead in time of possession or the number of plays ran during the game last week, according to the Panama City News Herald. Defensively Will Ramsey has been a key cog for the Tiger Sharks, who racked up 19 tackles including three for a loss against Bloutnstown. The only loss for Port St. Joe overall came to Trenton which has enabled a running clock on every team it has played this season, but could be a potential opponent for either team come the state championship game next week. Baker which found itself with its defense vulnerable at times during the early part of the season, has found its stride in the process of winning games late in the season and has done so convincingly during the first two rounds. In doing so this is history in the making for Baker which is their first trip to the state semifinals since 1999. The dominating effort last week resulted in nearly 400 yards of offense for Baker which could be a problem for Port St. Joe if they can’t contain the recent impressive performance from the Gators. Overall this game could come down to who has the ball last and who plays the best defense. Skinny: With Madison County being in their first year of Class 1A, it was expect that either them or Fort Meade or Pahokee could be potential contenders for the Class 1A state championship this season. Through the process, Trenton shut the door to Fort Meade making a statement, while Dixie County took care of Pahokee in the process. If it is staggering to think that Trenton has placed a running clock on each of its opponents they have played this season, it is staggering to think that Madison County started off the season 0-3 before claiming their first win of the season. According to Florida High School Football historian Richard Burton through the help of Jordan Kroeger at the Lake City Reporter, Madison County has rushed for nearly 800 yards in their two playoff games. However, the biggest concern for Madison County could come if they struggle again this week against Trenton like they did with Fort White. That could actually happen considering the defense that Trenton has been able to put up against opposing teams with Hamp Cheevers (hey wake up Division I teams) who has been the biggest leader for the Tigers. Depending on how the teams come out in the first half will set the tone for how the game could finish. That means either Trenton could get their first win against Madison County and do it with a running clock or Madison County flexes it muscle.